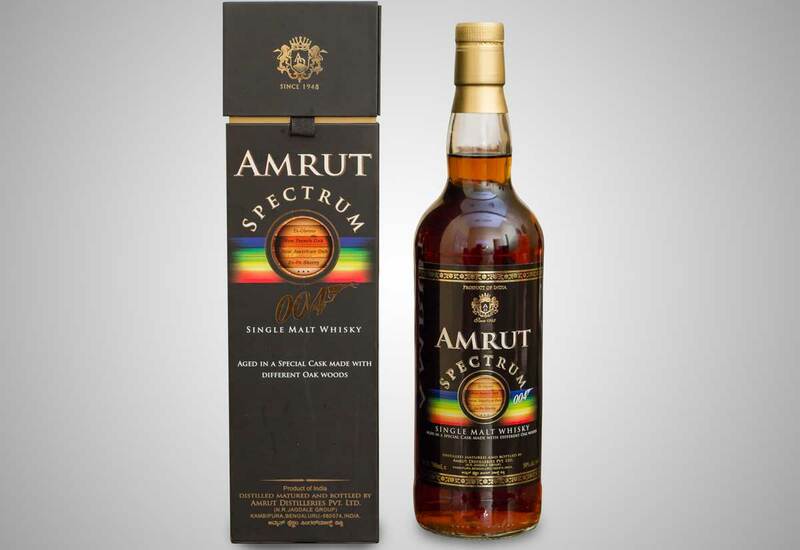 Amrut Spectrum 004, a Single Malt Whisky by Amrut aged in a special cask made of 4 different Oaks. Riding on the wave of the Spectrum 005 (launched in 2016), one of the most sought after brands in the Single Malt world, Amrut is delighted to announce the launch of the Spectrum 004, a whisky aged yet again in a custom built barrel. The 'Spectrum' series is one of a kind in the world, an unparalleled innovation using a barrel that is made not using one kind of Oak staves but four different types. To make the Spectrum 004, a two part maturation technique has been employed, the first being maturation of New Make spirit in ex-Bourbon casks followed by transferring the aged spirit into the custom barrels. The custom barrels are made with 4 different kinds of staves , new American Oak with Char level 3, new French Oak with light toasting, ex-Olorosso staves and ex-PX Sherry staves. The aforementioned barrel has equal proportions of all four kinds of staves arranged in a one-after-the-other manner lending their own characteristics and complexities to the malt coming into its own on the nose and the palate. The Spectrum is a testament to Amrut and India's commitment to constantly innovate and release whiskies that will push the boundary yet amaze the discerning consumer what the 'liquid gold' can be capable of with a twist of innovation. 1800 bottles of this amazing whisky have been bottled and they are currently in transit to locations in Europe, USA and Asia Pacific to local distributors and retailers. Nose : Raisins, rum, nougat, figs, oranges, tiramisu, cocoa, caramel, coffee, dried fruit, burnt rubber. Taste : Sherry, rum, butterscotch, chocolate, prunes, molasses, pecans, walnuts, almonds, English wine gum. Finish : Caramelized almonds, old cognac, apricots, Brazil nuts.